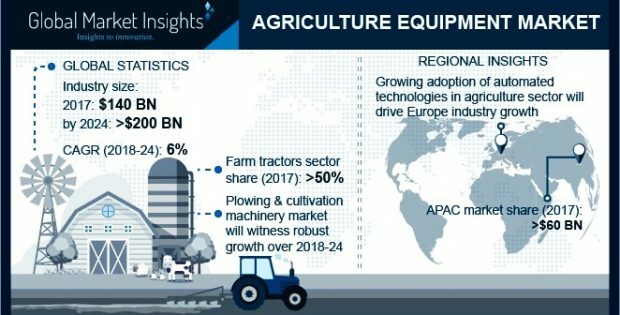 Global Market Insights has recently added a report on Agriculture Equipment Market which provides a succinct analysis of the market size, revenue forecast, and the regional landscape of this industry. The report also highlights the major challenges and current growth strategies adopted by the prominent companies that are a part of the dynamic competitive spectrum of this business sphere.North America agriculture equipment market is expected to witness a high growth over the coming years owing to the rise in the adoption of automated machines for performing farming activities. Agriculture Machinery (Equipment) Market is expected to exceed USD 200 billion by 2024. 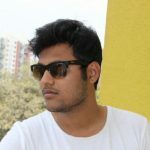 The integration of smart technologies and adoption of IoT technologies into several industrial sectors is growing rapidly, thereby encouraging manufacturers to provide connected solutions to their customers. These technologies provide remote monitoring and control of the several farming processes, allowing the farmers to improve the efficiency and productivity. For instance, in September 2017, Mahindra & Mahindra Ltd. announced the launch of its first driverless tractor. The tractor also has remote engine start and stop feature. These technological advancements are driving the adoption of the tractors in farms to increase the efficiency and reliability in farming operations. The high adoption of these machines is being witnessed in the Asia Pacific region, driving the agriculture machinery market growth. Growing adoption of tractors for farming processes, such as plowing and harrowing, is driving the agriculture equipment market. This equipment provides several advantages in performing farming operations such as pulling heavy loads, withstanding harsh conditions, and increasing productivity and efficiency. Manufacturers are integrating effective technologies in these machines to enhance its performance and applications. Countries including the U.S. and Canada have a strong presence of players, which are engaged in developing effective machinery for enhancing the productivity of the farm processes. Companies are offering products with enhanced quality, features and technological innovations to strengthen their customer base in the North America agriculture machinery market. Increasing urbanization in the region and high productivity demands from the farming sectors are driving the industrial growth. Moreover, emerging technologies including sensors, drones, and unmanned vehicles are expected to revolutionize the agriculture machinery market over the coming years. Several advantages of these smart solutions include increased production, accurate farm and field evaluation, and reduced environmental footprint. Increasing labor costs in several countries are expected to generate a high demand for automated machinery, thereby driving the agriculture equipment market. Countries including the U.S., Canada, the UK, and Germany are experiencing a high demand for the machines owing to the lesser availability of workforce. In addition, the increasing need for effective solutions to improve the performance, speed, and efficiency in performing farming operations is driving the agriculture machinery market growth. Major companies operating in the agriculture equipment market include Escorts Group, Kverneland Group, CNH Industrial N.V, Iseki & Co., Ltd., Kuhn Group, Yanmar Company Limited, Deere and Company, AGCO Corp., ARGO SpA, Alamo Group Incorporated, Claas KGaA mbH, Bucher Industries AG, JCB Limited, Kubota Tractor Corp, Mahindra & Mahindra Ltd., and Tractors and Farm Equipment Ltd., among others. The companies are targeting their offerings in the regions where a high demand for agricultural activities is being witnessed. They are integrating several technologies with their products to cater to the varying demands of the agriculture machinery market.